What should we do with the hundreds of thousands of frozen embryos held in fertility clinics around the world today? One solution would be adoption. Would such a course of action be moral? That is the question faced in this volume. 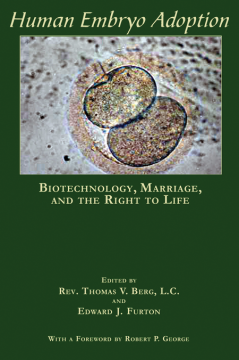 The leading thinkers in Catholic bioethics divide into two opposing camps in a great debate over biotechnology, sexuality, marriage, and the right to life. The question is visceral for many. The idea of a woman taking the embryo of another into her womb provokes disdain among those who find this an infringement on the sanctity of marriage, while the proponents of embryo adoption argue that the sanctity of human life, and the innocence of the victim of this cruel fate, obliges us to take heroic action. The debate naturally touches on many other related topics, such as the widespread use of IVF, the willingness of some to see human embryos as tools for research, and the odd status of embryos preserved indefinitely in frozen storage. Embryos are indeed being adopted today, and successfully to term, but is it right to do so? With a foreword by Robert George, and some practical advice from the editors offered in an afterword by Rev. Thomas Berg, L.C. 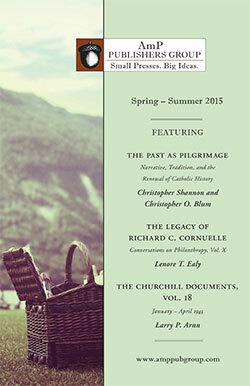 and Edward Furton, the core of the volume is a who’s who of Catholic scholars. The book originated from a forum assembled and sponsored by The Westchester Institute for Ethics & the Human Person. Edward J. Furton, Ph.D., is an ethicist and Director of Publications at the National Catholic Bioethics Center in Philadelphia, Pennsylvania.